"By the time Carl and I started growing tomatoes, they were one of New Jersey’s most popular and most highly valued products. South Jersey supplied fresh tomatoes each summer to Philadelphia and New York. In addition to canning them, the industry turned them into tomato juice, tomato soup, and ketchup. With two tomato processors in Bridgeton, P.J. Ritter and Pritchard’s, the summer air was filled with the mouth-watering aroma of ketchup being cooked in huge vats laden with spices. This aroma was an integral part of every summer of my youth. Of all the crops that we could grow, Carl and I chose tomatoes. Why? For one thing, the growing season of the tomato meshed well with the academic year. That is not to say there was no overlap, because the tomato fields had to be planted in April or, at the latest, early May—well before school was out. At the other end of the season, when school started in the fall, there were still tomatoes in the field. This too was scramble time for us. At the same time, tomatoes are fun to grow. They are so responsive and productive. Displaying its fruit—some ripe, some ripening, and some still green—a tomato plant is a work of art. And I like the distinctive aroma of a tomato plant. To this day when I see a tomato plant I cannot resist smelling it. One of the challenges for us was how to finance our ever-expanding tomato operation. My brother and I had an understanding with Pop. As long as we did our chores and got everything done and done well, Pop did not care what we did with the rest of our time. So in the spring, for example, my brother assumed the responsibility of milking not only the cows he was responsible for, but also mine. I, meanwhile, would run a mile and a half to a local farm to spend a couple of hours before school helping the farmer cut his four acres of asparagus. He paid $1 an hour, enabling us to accumulate some cash. It also provided some training, since I was running the mile on the school’s track team. In addition to picking strawberries and cutting asparagus for other farmers, we would also help at hay baling time using an old truck we had bought to haul hay bales from the field to the haymow. Farmers liked to hire Carl and me because we worked so hard. We also competed with each other. I was the first to pick 100 baskets of tomatoes (thirty-five pounds each) in one day. Then Carl took it to 102. After that, the record went back and forth between us: 105, 107, 108, and then 110. It was no accident that I won the Cumberland County Junior Tomato Picking Championship in 1949! Nor that Carl was selected as a New Jersey Star Farmer by the Future Farmers of America! 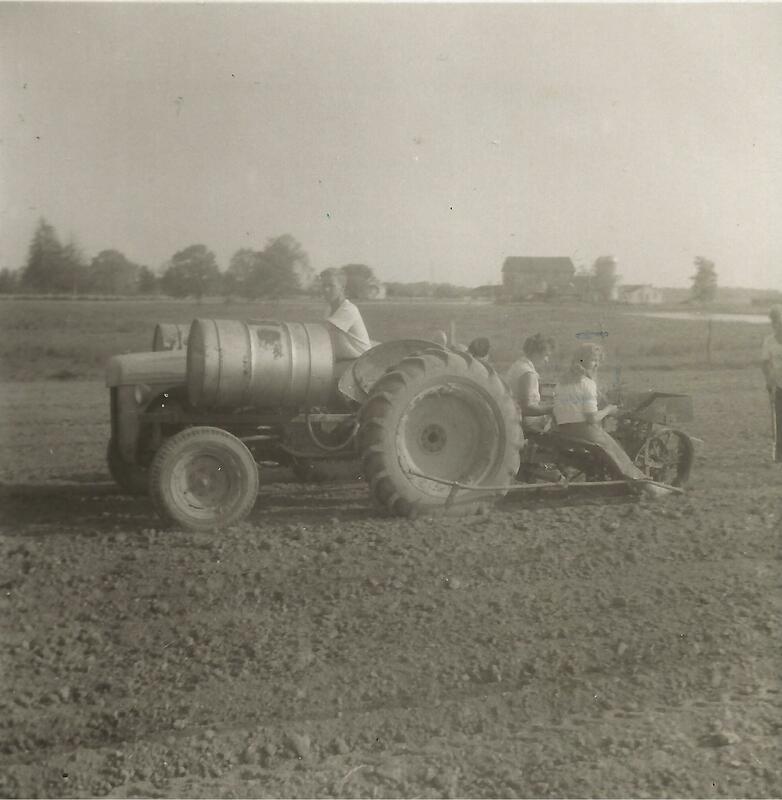 In 1949 we bought our first tractor—a J.I. Case two-plow, mid-size tractor of ancient vintage—largely with earnings from picking tomatoes for other farmers. At 10¢ a basket for picking tomatoes, it took 2,000 baskets to pay for the tractor. In late August 1951, on the weekend before I was to report to Rutgers University for freshman orientation, we faced a logistical problem. While I had a driver’s license, Carl did not. Once I left for Rutgers, Carl would still need to get tomatoes from our farm to the cannery a dozen or so miles away. The problem wasn’t so much the lack of a license, really, because young people on a farm often drove locally before they were licensed. The problem was that Carl had never driven a truck laden with tomatoes stacked five baskets high. With this in mind, we decided to take a load to the cannery on Saturday, the day before I left. Loading over 200 baskets of tomatoes onto a truck is an art in itself. The body of a tomato truck is designed so the tomato baskets can be stacked in an extended pyramid, stretching from the front to the back. The sideboards enabled us to put another layer of baskets leaning in against the pyramid on both sides to stabilize it. It was a tried-and-true way of moving tomatoes from the farm to the processing plant. Our aging 1935 Chevrolet truck carried at least four tons of tomatoes. We decided that Carl would drive the truck to the cannery and I would follow in the pickup soon after. He would have to get it in line, because there was always a long line of trucks waiting for hours to be unloaded. The last stretch of road of five miles or so to the cannery was straight. Carl driving the heavily loaded truck came up behind a local farmer who was drawing two or three implements behind his tractor. Carl prepared to pass and was already well onto the left side of the road when he realized the farmer was going to move out into the center of the road to make a right turn into his driveway. The truck’s wheels went over onto the dirt shoulder and the truck began to lean with its heavy load. Carl pulled it back onto the road, but not all the tomatoes made it back with him. Part of the load tumbled off, leaving tomatoes strewn several inches deep across a swath of the road. He pulled over to assess the damage and wait for me. By the time I arrived, cars had already driven over the road—and through the tomatoes. But as though they were driving through newly fallen snow, the drivers had kept to one lane, carefully using the same ruts to minimize the damage. Someone suggested we call our field agent at P.J. Ritter. We called from the farmer’s house and the agent arrived quickly. Taking stock of the situation, he saw that most of the tomatoes on the road were still in good condition. Many were bruised and some were cracked, but it was obvious we had picked them carefully and that they were of unusually high quality. He suggested that we borrow a couple of shovels or scoops from the farmer to get as many of the tomatoes back on the truck as we could, preferably without sand or gravel. He said we wouldn’t be able to get all of them, but we could get most of them. He requested that we then ask the farmer if we could park the truck behind his barn out of public view, since these cracked tomatoes could become a public relations issue for Ritter. And he told us to bring the truck into the plant the next morning at 5:30 a.m., when they would unload it immediately to minimize the chance of the cracked tomatoes spoiling. Despite the loss of a small part of this load, we delivered many other loads and did well that year. We were officially tomato farmers. And since we did most of the work ourselves, much of the check that we got in November for all the tomatoes we had delivered put us in a position to buy another tractor—a brand-new one. My brother and I knew exactly what we wanted, a new Ford two-plow tractor. I suggested that he go ahead and buy it. Carl had worked hard and I wanted him to have the experience and satisfaction of buying the tractor. He went to the local farm equipment dealer, who obviously knew us, but who was not well prepared to sell to a fourteen-year-old. It took him awhile to realize that my brother was serious and that he wanted not only a tractor but also the plow and cultivators to go with it. We bought that tractor in the fall of 1951 for $2,100 with an initial down payment of $700 and with the remainder to be paid in $700 installments in the fall of each of the next two years, a typical arrangement for farmers. We had started growing tomatoes just when the industry was on the verge of rapid change. After a couple of years of planting by hand, we got a mechanical transplanter. The transplanter, on which four people could ride, planting two rows of tomatoes at a time, was drawn behind the tractor. Mounted on each side of the tractor hood were two drums filled with water that contained a liquid fertilizer. Thus, as each plant was going into the ground, roughly half a cup of water would be released at the same time to provide moisture around the roots of the plant as well as the essential nutrients: nitrogen, phosphate, and potassium. This helped to get plants off to a faster start than with traditional hand-planting. As our tomato-growing operation grew, we shifted from the local tomato processor, P.J. Ritter, to Campbell Soup, which could readily handle our larger harvests. It is hard to believe today that we were producing and delivering tomatoes to the Campbell Soup plant in Camden, New Jersey, for $34 a ton. During our first year of tomato growing with only seven acres, Carl and I picked nearly all the tomatoes ourselves. But as I expanded the acreage, eventually to seventy acres (280,000 plants) in 1958, we needed a lot of help with the picking. Our pickers included classmates, friends, and, as we grew larger, seasonal workers from nearby Salem and even some from Puerto Rico via a contract with the Puerto Rico Department of Labor. 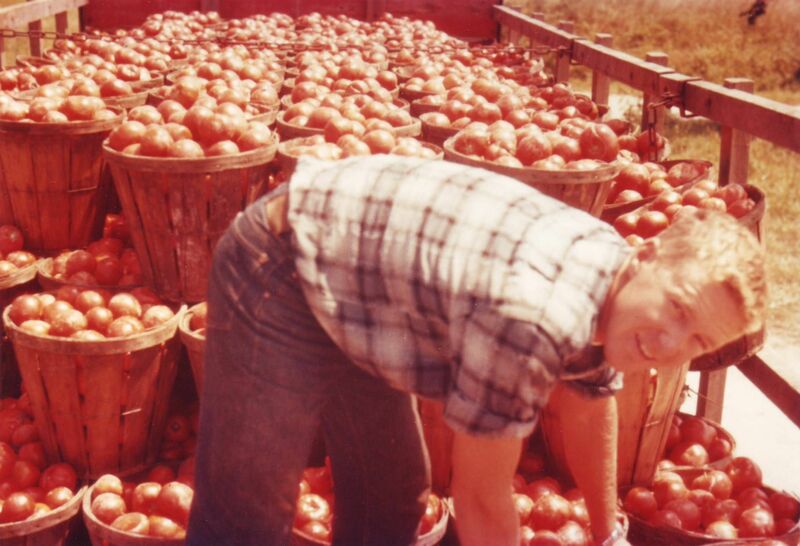 In 1958, I ma rketed 1.5 million pounds of tomatoes, becoming one of the largest tomato growers in New Jersey. The eight-year tomato-growing period of my life, 1951 through 1958, began during my senior year in high school, spanned the four years at Rutgers, the months I lived in villages in India in 1956, and two years beyond that. I had developed an attachment to the land. Even now whenever I return to Stow Creek for family visits, driving through the countryside with its fertile, sandy loam fields, patches of woodland, and creeks, I enjoy a sense of peacefulness and of being grounded." To read more of Lester Brown's experiences growing tomatoes as well as other parts of his life, purchase a copy of Breaking New Ground today for our special sale price of $15.00.